Seattle.gov is a website for the city of Seattle, listing valuable information to both the people of Seattle, and the people visiting Seattle. The site includes a large directory of various services in Seattle as well as an overview of the latest news and weather conditions for Seattle. The site has a neutral look in terms of the colors used. The design of the site is cluttered with a lot of information, making it difficult for the visitor to identify what they are looking at. The front page is very rich on information, and although various categories are listed at the top of the page, the site looks very busy. The site has a search box and links to other pages of the site as well as to other government sites. 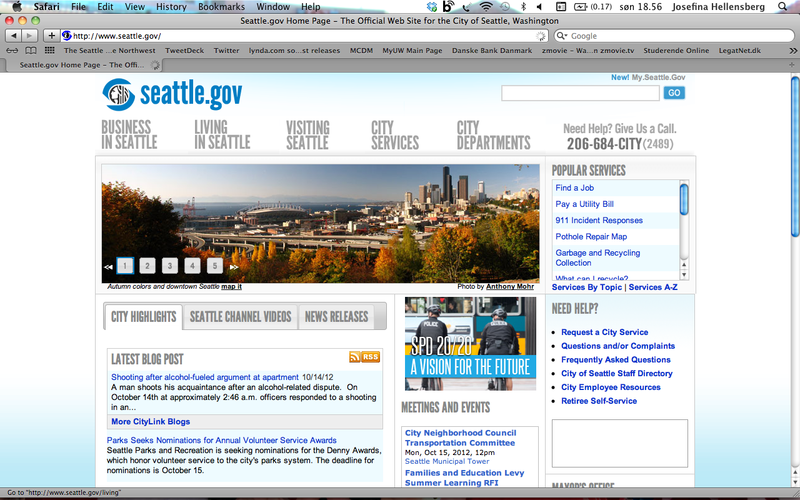 The front page is static, but features a slide show of pictures of Seattle at the top of the page. The audience is the adult citizens of Seattle as well as the visitors of Seattle. To service the citizens of Seattle, as well as promote the city to visitors. The site features both RSS, twitter, and facebook. The site also offers links for visitors to follow them.